LAKE GEORGE, N.Y., Apr 13, 2017 (SEND2PRESS NEWSWIRE) -- Residents of the Lake George, New York area and its surrounding communities who are harboring the dream to build, renovate, or maintain a log home are invited to speak with the industry's top log home and timber frame companies and builders along with industry experts during the Lake George, N.Y. Log & Timber Frame Home Show being held at the Lake George Forum, May 5-7, 2017. The show will run Friday from 1 - 7 p.m., Saturday from 10 a.m. - 6 p.m. and Sunday from 10 a.m. - 4 p.m. Admission is $12 per person at the door and $10 per person online or with discount coupon. Children 18 and under are free. Admission is valid all days. 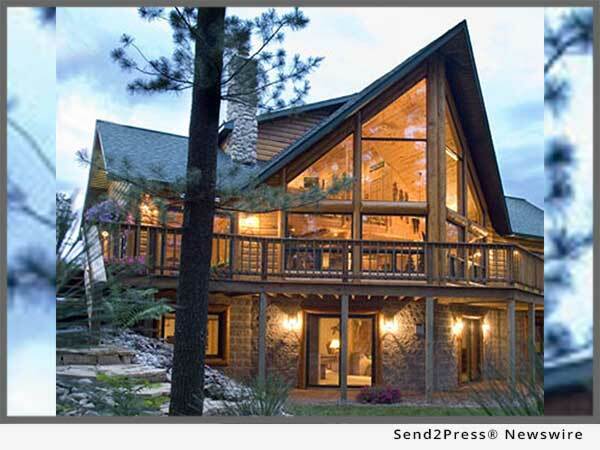 "Log homes have become an icon of peaceful living in our culture. We've all probably vacationed in one at least once in our lifetime and just looking at one can bring a sense of peace into our chaotic world," says The Log Home and Timber Frame Home Show Manager, Eric Johnson. "So it's no wonder that people want to live in one of these beautiful homes, and that's where we come in. The log home and timber frame home market is very unique and we are excited to help produce the largest traveling show in the United States to promote the building and renovation of these homes. "While our exhibitors vary from show to show, we are excited to feature log home and timber frame home builders and manufacturers, maintenance and restoration companies, and one-of-a-kind rustic furniture and accessories at our upcoming Lake George, New York show. Our goal is to educate and equip those looking to build a log home or timber frame home through seminars and face-to-face time with experts in the field." Exhibitors will be on hand to assist visitors with construction and financing questions, floor plan ideas, maintenance options, and more. Visitors are encouraged to bring their own home plans and ideas to be reviewed by industry experts. Attendees will be able to take part in a variety of free seminars presented by industry pros held throughout the weekend. For a full list of exhibitors and seminar presentations, visit: http://www.loghomeshows.com/. The Log Home & Timber Frame Home Shows are held throughout the country. Please call (518) 618-1195 or go to http://www.loghomeshows.com/ for more information.